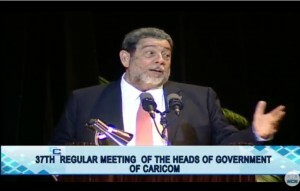 St. Vincent and the Grenadines Prime Minister, Ralph Gonsalves addressing the opening of the 37th regular Caricom Summit at Guyana’s National Cultural Centre. St. Vincent and the Grenadines Prime Minister, Ralph Gonsalves on Monday urged fellow Caribbean Community (Caricom) leaders to stop lamenting about the impact of Britain’s exit (BREXIT) from the European Union (EU) and instead explore available opportunities as a result of that move. Gonsalves said there was no room for Caricom to join in the “hysteria” about BREXIT. “We have embraced the hysteria rather than saying this BREXIT contains within it possibilities, opportunities and we must look for them rather than to bemoan what has happened. That is not going to get us anywhere,” he told the opening of the 37th regular Caricom Summit. The long-serving St. Vincent and the Grenadines Prime Minister argued for the regional grouping to accelerate its work in the development of the Caricom Single and Market and Economy (CSME). Caricom’s Chairman, Dominica’s Prime Minister Roosevelt Skerrit, in his assessment, said it appeared as though Britons voted to exit the EU for the historical fear that it would have lost its sovereignty and that its social welfare system would have come under immense pressure from EU Citizens as well as refugees from other countries by taking advantage of the EU’s free movement system. Skerrit called on fellow Caricom leaders not to “blindly imitate” BREXIT but instead facilitate stronger collaboration and cooperation among member-states to build a more vibrant community. “It may be that Britain’s exit from the EU will lead to renewed cooperation on better terms with the Commonwealth and bring greater benefits to all as we seek a safe and viable space in the global marketplace,” he said. Among those expressing concern about the impact of BREXIT at the opening of the Caricom Summit at Guyana’s National Cultural Centre was the 15-nation grouping’s Secretary General, Irwin La Rocque. “The decision of the people of the United Kingdom to leave the European Union has far-reaching implications not only for the UK and Europe but also for us. It could impact on our trade and development assistance,” he said. At the same time La Rocque noted that the implications might change global geopolitics. Jamaica’s Prime Minister, Andre Holness predicted that BREXIT would have far-reaching impact on Caricom’s already vulnerable economies in trade, tourism, financial services, immigration, development assistance and overall Caricom-UK / Caricom-EU relations. “As a region, we must proactively assess the likely threats and opportunities these global changes present,” he said. Holness recently appointed a bipartisan commission of inquiry, inclusive of civil society and academic, to assess the economic and growth impact of Caricom on Jamaica and its wider relations with the Dominican Republic and Cuba. Issues on the agenda of the July 4 to 6 Caricom Summit include crime and security, de-risking by European and American banks by cutting correspondent banking relations with Caribbean banks, an overview of the 10-year old Caricom Single Market and the status of free movement of Caricom nationals.